Klein Tools Non Conductive Fiberglas Fish Tape, 100 ft. Protect yourself electrical wires and equipment with Klein Tools' non-conductive fibreglass fish tape. This fish tape is made with a non-conductive tape, tip and case for added protection against energized circuits. This new non-conductive fish tape minimizes the potential human risk and equipment damage that can occur if live circuits are present. The non-conductive fish tape and eyelet tip slide easily over existing wires and through multiple bends. Non-conducNon-conductive fish tape and eyelet tip offer added protection against shock from energized sources. Non-conductive fibreglass fish tape for flexibility and easy navigation through conduit runs. Non-conductive eyelet slides easily over existing wires and through multiple bends. The lightweight, strong fibreglass tape resists harsh elements and is strength rated for up to 500 pulling pounds. This high quality silicone self-sealing tape insulates all shapes of conductors to 400 V. 1 roll is 1-inch W x 10 ' L (2.54cm W x 3.05 m L) Installation instructions: Thoroughly clean area to be wrapped. Remove Mylar liner as tape is installed using caution to keep tape surface clean. Begin wrap with one full overlap of tape onto itself with minimal stretch. Stretch tape to 3/4 normal width on subsequent wraps while half-lapping. On each half lap, match edge of tape to center guideline to previous layer. At end of area to be wrapped wrap one full turn of tape onto itself as if beginning step with minimal stretch. This will insure tight adhesion. Total curing will occur in 24 hours at room temperature. Non Conductive Fiberglas Fish Tape, 100 ft. 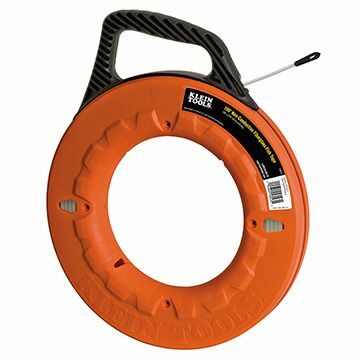 Protect yourself electrical wires and equipment with Klein Tools' non-conductive fibreglass fish tape. This fish tape is made with a non-conductive tape, tip and case for added protection against energized circuits. This new non-conductive fish tape minimizes the potential human risk and equipment damage that can occur if live circuits are present. The non-conductive fish tape and eyelet tip slide easily over existing wires and through multiple bends. Non Conductive Fiberglas Fish Tape, 100 ft. is rated 4.1 out of 5 by 64. Rated 5 out of 5 by Paulie from I do a lot of low voltage work and this... I do a lot of low voltage work and this baby works like a charm. It's really light and the fiberglass tape pulls very smoothly. Highly recommend the extra few dollars for the fiberglass model. Rated 5 out of 5 by HomeDepotCustomer from Best of the Best!!!... Best of the Best!! !